The wrestlers from the Christian Wrestling Federation meet shortly before the matches begin to pray, sing worship songs, and plan the matches and basic script for the night. Storm warms up with a weight bar shortly before his match. "Angel", shaves his arms to get ready for his match. Most professional wrestlers shave the hair from their arms, legs, and armpits before wrestling. It shows muscle definition better, allows them to perform wrestling moves easier, and is more sanitary if you’re going to have your face shoved in your opponent’s chest or armpit. 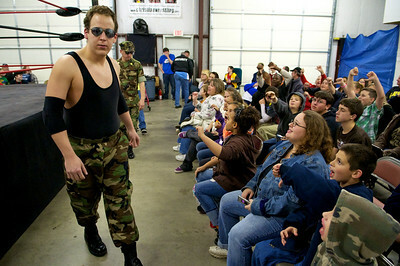 Private First Class Ronny Graham and his manager Major Inconvenience get booed by the crowd as they makes their entrance for a match. The CWF has good characters and bad characters and the crowd is encouraged to boo and cheer for each wrestler respectively. 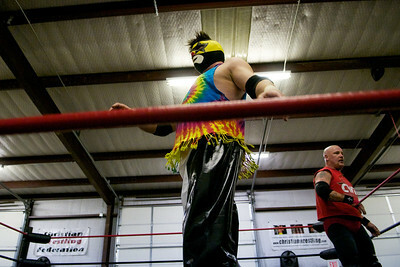 January 22, 2011 - Christian Wrestling Federation Event in Rockwall, TX. Bishop chokes newcomer Earl Ray with his foot in the second match of the night. Two young fans scream at the wrestlers during a tense moment in the match. Angel grimaces in pain as Storm pins him with an arm hold during their match. Angel, a good character, would go on to win the match. Storm (left) and Angel (right) laugh together as they talk about their match and the final takedown that gave Angel the win. Jay, the current CWF champion, prays with a young fan who raised his hand during the message to say that he wants to accept Jesus as his savior. The wrestlers pray with each person who raises their hand, approximately 15 people on this night. A fan gets her shirt signed by Earl Ray at the end of the night as she collects autographs from all the wrestlers. At the end of the evening, the wrestlers say one final prayer together before going their separate ways.